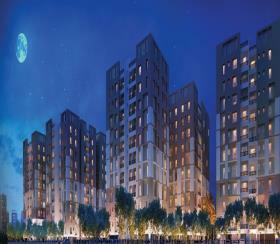 Get a taste of classy lifestyle in Unimark Springfield, Kolkata! Unimark, one of the most dynamic developers in the contemporary times, has come up with an exotic presentation in Kolkata. 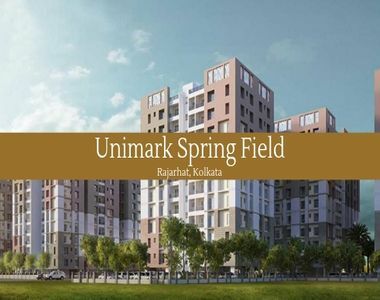 Have a look at Unimark Springfield Kolkata, the residential complex that has just come up in Rajarhat, one of the fastest emerging residential Property in Kolkata. If you have a fascination for sophisticated lifestyle, with all the necessary amenities around, this is an ideal opportunity for you. 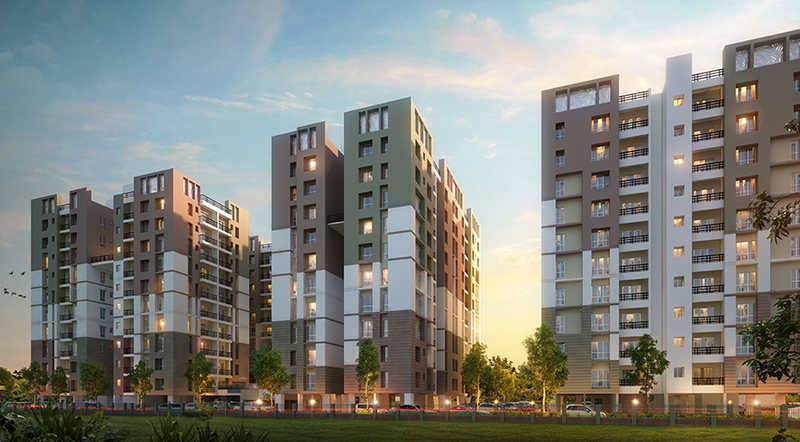 The location of Rajarhat is one of the most important reasons for the craze behind its real-estate projects. Being a part of one of the largest metropolitan cities of the country, it is shrouded by a refined culture, art and tradition. This project from Unimark targets the high-end buyers, who crave for easy transportation facilities, comfort and an elegant lifestyle, amid green zones. The commercial importance of Kolkata is one of the reasons behind the large-scale migration of people here. 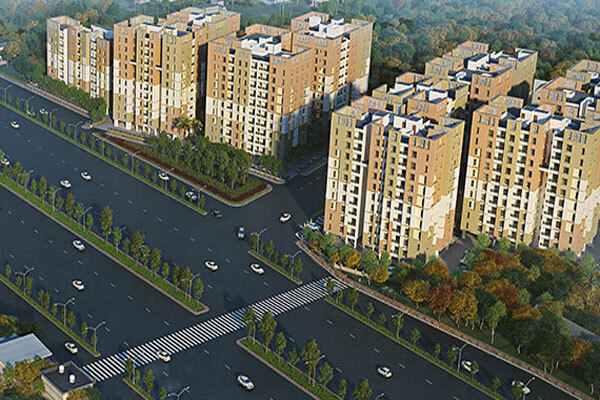 Rajarhat has been developed with broad thoroughfares and good town-planning. The residents can zip through the streets to any desired location in quick-time. Besides, it is close to a number of commercially important places like Salt Lake Sector V, the IT hub of Kolkata. 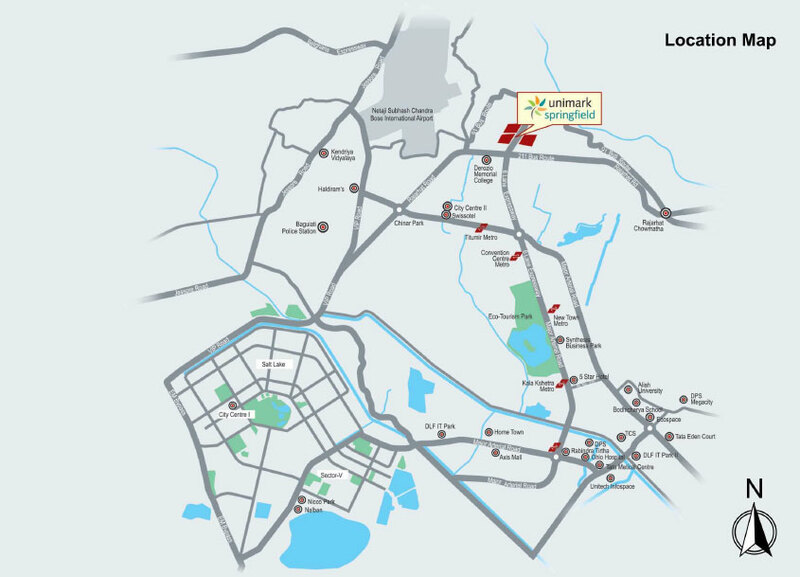 Residents in Unimark Springfield Rajarhat can reach VIP road in 11 Mins, while the Airport is located 15 minutes away from the region. People interested in eco-tourism will also find their ideal destination here, with the Rajarhat Eco Park located close to the residential estate. The upcoming east-west metro project will further bolster transportation facilities in the region in the coming years. You will need just 2 Mins. To reach the metro station, that is being developed here. The Akankha bus stop is also located near the residential complex. The Unimark Springfield Price starts from INR 39.81 lakhs and ranges up to INR 55.51 lakhs. Exotic apartments, with elegant finishes and spacious interiors, await you at one of the most demanded residential areas of the city. Besides, a number of shopping malls and multiplexes have come up in the area in the last few years. You can enjoy easy access to all these places. The number of schools and hospitals in the area has also increased in recent times. Fast transportation facilities make it easy to reach the other important commercial zones like Esplanade, Central Avenue, and Park Street, among others. The residential complex also offers a number of amenities that you would like. Fitness lovers will enjoy their time in the swimming pool or gym. The meditation centre brings you the perfect opportunity to cultivate your spirituality. Besides, you can enjoy your time in the clubhouse. Various indoor and outdoor sports facilities are available for the residents here. Investors and homeowners willing to buy an apartment in Unimark Springfield should make their move now. The booking process is open and the number of residential units is limited. Get a taste of cultured lifestyle, while you reside in one of the most traditionally refined cities of India. Located at Rajahat, Action Area, Kolkata.